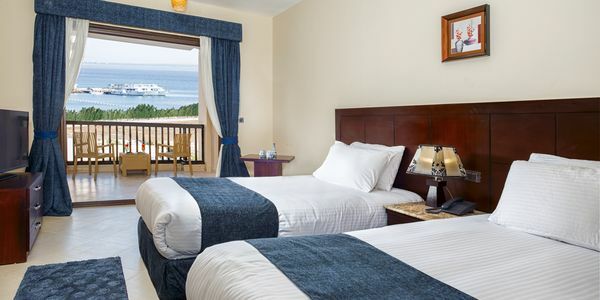 One room for 1-3 persons, king size bed or twin bed with the balcony and pool or sea view. There is LCD TV with private receiver, built in safe, telephone and air condition in the room. Your private kitchenette is equipped with mini-bar, complimentary tea and coffee making facilities. In the shower room you will find hair dryer. 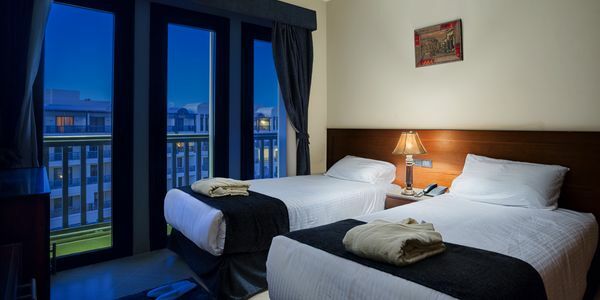 One room for 3 persons, three separate beds with the balcony. 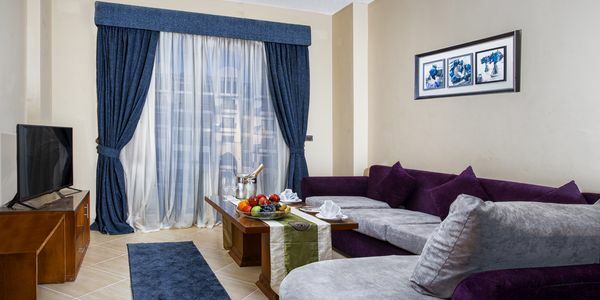 There is LCD TV with private receiver, built in safe, telephone and air condition in the room. 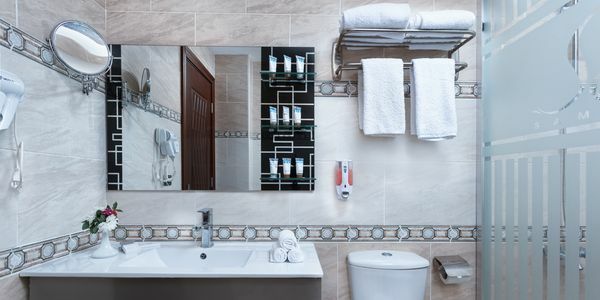 Your private kitchenette is equipped with mini-bar, complimentary tea and coffee making facilities. In the shower room you will find hair dryer. Living room with sofa bed, one bedroom king size bed or two beds for 3 persons with the balcony and pool, garden or sea view. 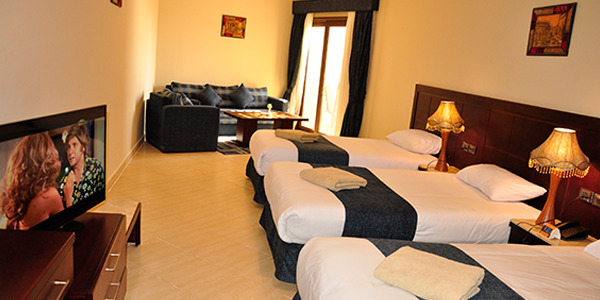 There is LCD TV in each room with private receiver, built in safe, telephone and air condition in the room. 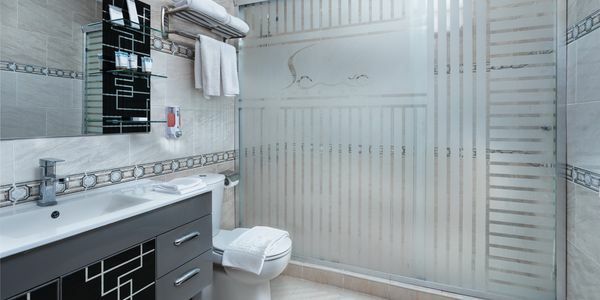 Your private kitchenette is equipped with mini-bar, complimentary tea and coffee making facilities. In the shower room you will find hair dryer. Living room with sofa bed, two bedrooms king size- one with king size bed and another with two beds for 5 persons, with the balcony. 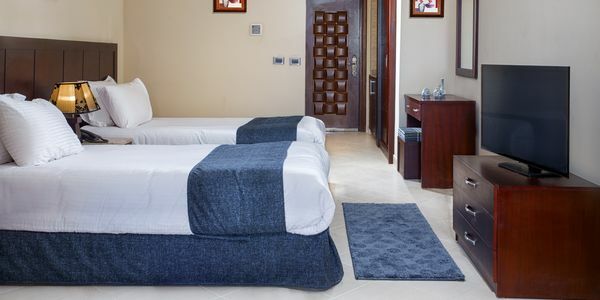 There is LCD TVs and private receivers in each room, built in safe, telephone and air condition in the room. Your private kitchenette is equipped with mini-bar, complimentary tea and coffee making facilities. There are two bathrooms with shower room and hair dryer. Request a booking and we'll get right back to you.